Something great reported by Haaretz and now JSF: the British Embassy has changed its plans, and will not rent space in a Tel Aviv building partly-owned by Lev Leviev, the diamond merchant who has financed colonies in the West Bank. The embassy took the step after critics of Leviev called upon the Brits not to give him money. How long before anything approaching this standard comes to the U.S., where a lot of Jews and non-Jews are all mobbed up with the colonial system in Palestine and our media avoid the story? THE LUBAVITCH ARE EVEN A PROBLEM IN ITALY! An authoritative member of the 1000-person Florence Jewish community explains the motives behind the finding of a small camping gas bottle Saturday January the 17th in front of the ‘Chabad House’ in via de’ Pilastri 48 (the place the Lubavitch have in every important city to host their followers). It is the Holocaust Remembrance Day and he wants to shed light on the episode. An anonymous source, whose words are nonetheless in agreement with the detectives working on the case about the bomb found during a Jewish sacred day. At first the sleuths had thought about an anti-Semitic act in relation with the bloody Israeli military operations in the Gaza Strip. The ‘bomb’ had a rudimental fuse, unable to let the gas explode. The hypothesis was plausible, almost obvious, but was soon abandoned to follow clues about a personal vendetta. A vendetta unleashed by somebody who had disputes with the ultra-orthodox Lubavitch. No one claimed to be the author of the action, something odd if there had been political motives. The Florence Jewish environment is extremely fragile: two ways to think about and practice Judaism coexist. From one side almost all of the community, led by Joseph Levi, the rabbi of Synagogue in via Farini. From another side, the ‘Hassidim’, the most rigorous Jewish denomination: during the Shabbat they do not turn the lights on and they do not use the lift. In 2000 Eli Borenstein, one of the most influential leaders of the Italian Lubavitch, bought an old shop to open the Chabad house (inside there is only some old stuff). The location is strategic to attract potential new ‘Hassidim’. Problems in the few yards between Via Farini and via de’ Pilastri soon arose. These Florence Jews are called ‘Lubavitch’ or ‘Lubavitcher’, a branch of Hassidism, borrowing their name and their ancient traditions from the old Russian town of Lubavitch, destroyed by the Nazis in 1941. Black coat, payot, and black hat: they come from all over the world to meet their leader Borenstein, who, however, lives in Bologna (where he received another ‘warning’) and goes to Florence only once a week (on Saturdays, that is) to host and cater for his followers. The Shabbat is a sacred day when it’s prescribed not to walk for long, not to prepare food, and not to do many other things. There is even a rule about not using the telephone: it’s because of this that, curiously, Borenstein warned the Police only after dark, when Shabbat was over, even if he had seen the ‘bomb’ already during the morning. “We hope to live together peacefully, but to see the Lubavitch proselytize with the Jewish American tourists in front of the Synagogue doesn’t seem to be very good for the community”: this was reported in the Florence edition of ‘La Repubblica’ soon after the arrival of the Lubavitch in town. A dislike that soon degenerated into a conflict between the two groups: this however is only the background of the intimidation act of Jan. the 17th. It could have been the result of personal motives. The above article appeared ‘Il Firenze’ a Florence newspaper on January the 28th. New York, NY – A group of Lubavitch Chassidim, members of the Chabad Jewish Community in Brooklyn, NY, is planning on monitoring the well being of Shalom Mordechai Rubashkin, imprisoned head of the Agriprocessors Kosher meat plant in Postville, IA. The group, which has years of experience in assisting community members with legal troubles, turned their attention to Rubashkin six weeks ago. Called The Committee of Concerned Anash for Pidyon Shevuyim (Anash meaning Chassidim, Pidyon Shevuyim – the mitzva of redemption of prisoners) will focus on assisting the Rubashkin family. The Committee is working with top lawyers for the best defense and a public relations group, and will be collecting funds for the legal defense and keeping the community involved. Committee members include Levi Balkany, Yingy Bistritsky, Ari Chitrik, Sholom Duchman, Mendel Feller, Noson Hecht, Shea Hecht, Shmuli Hecht, Sholem B. Hecht, Sholom B. Lipskar, Benjy Stock, Zalman Vishedsky and Yaakov Weiss. They are joined by Suri Ciment, Hindy Labkowski and Molly Resnick. Several members of the committee held a private meeting today (Sunday) at the offices of The National Committee for the Furtherance of Jewish Education (NCFJE), a Brooklyn-based educational and humanitarian organization (which both Hecht brothers direct). Rabbi Pesach Lerner of Young Israel and Rabbi Chaim Dovid Zweibel of Agudas Yisroel are said to be planning a trip to Iowa to meet with Rubashkin in prison. This Tuesday, lawyers from Grefe and Sidney will be visiting Crown Heights to meet with the committee and residents. They are scheduled to meet with Aron Rubashkin, patriarch and founder of the Agri plant. What about the innocent?Lubavitch will raise millions for scum of their own! As many of you know, I proved a month ago that Chabad is raising tax deductible money and apply it to Sholom M. Rubashkin’s legal defense. Then, earlier today Chabad’s talking points for the defense of the Rubashkins was leaked by a Chabad blog. A new committee has been formed to supervise efforts to secure the release of Shalom Mordechai Rubashkin, former CEO of Agriprocessors in Postville, IA • The group, which is comprised of individuals with years of experience in assisting community members with legal troubles, began assisting Rubashkin six weeks ago • ‘The Committee of Concerned Anash for Pidyon Shevuyim’ will focus on assisting the Rubashkin familly in all matters. The Committee is working with a team of top lawyers for the best defense as well as a public relations group, and will be collecting funds for the legal defense and keeping the community involved with the cause, Chabad.info was told. Committee members include Levi Balkany [see here and here for details about Levi’s family], Yingy Bistritsky, Ari Chitrik, Sholom Duchman, Mendel Feller, Noson Hecht, Shea Hecht, Shmuli Hecht [is probably the Shmuel Hecht who offered property worth in excess of $10 million dollars toward Rubashkin’s bail and who is a Chabad rabbi and businessman in New Haven, CT, but could also be a nephew or cousin], Sholem B. Hecht, Sholom B. Lipskar [and here as founder of Aleph, which is raising tax deductible money for Rubashkin’s legal defense], Benjy Stock, Zalman Vishedsky and Yaakov Weiss, Suri Ciment, Hindy Labkowski and Molly Resnick. Members of the committee held a meeting Sunday at the offices of The National Committee for the Furtherance of Jewish Education (NCFJE). Following the meeting the committee held a press conference for the Lubavitch media in an effort to call on the worldwide Lubavitch community to take action, get involved, and donate to the Rubashkin legal fund. 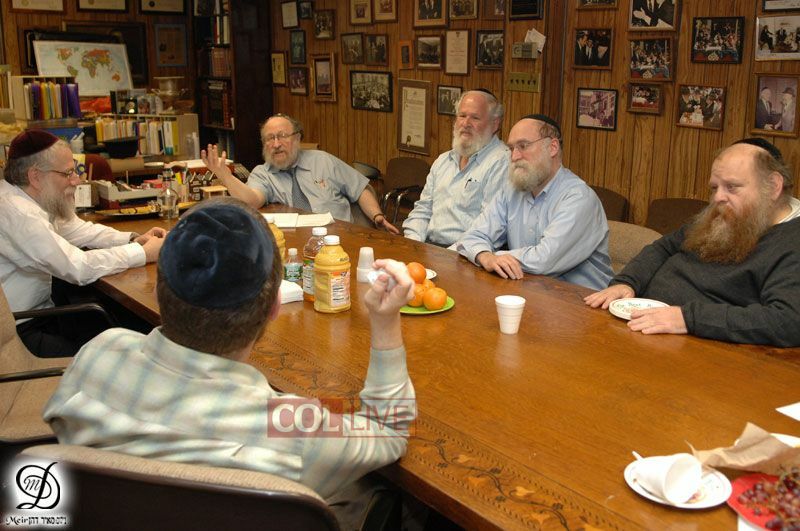 The meeting was attended by reporters representing many chabad news outlets, including Chabad.info. This Tuesday, lawyers from Grefe and Sidney, one of the firms defending Rubashkin will be visiting Crown Heights to meet with the committee and residents. They are scheduled to meet with Ahron Rubashkin, patriarch and founder of the Agri plant. Chabad can no longer deny that it is both raising money for Sholom M. Rubashkin’s defense and orchestrating much of the pro-Rubashkin / anti-government propaganda flooding media and the Web. That should not surprise regular FailedMessiah.com readers – I proved that almost a month ago. The following story is an excerpt from an article that appeared in the Village Voice on Dec. 3, 2008. The author is Elizabeth Dwoskin. Until three years ago, Miriam Shear and her husband were philanthropists who had given hundreds of thousands of dollars to Jewish charities, supporting schools in Boca Raton, Florida, Memphis, and Louisville. They say that the Rubashkins’ strong-arm business practices drove them into bankruptcy. The Shears had grown wealthy selling alarm systems and life insurance. As members of a small community of Orthodox Jews living in Memphis, they ran a successful kosher-food bank that served a few hundred Jewish families. Incensed at what they say were astronomical prices for kosher food—a three-pound block of cheese at Kroeger’s, the only grocery in town, cost $25—the couple decided to open a rival store in 2003. They called their business the Kosher Case Club. Hoping to expand into meat and poultry, Shear met with Heshy Rubashkin at Lubinsky’s annual kosher-food show in New York. But Heshy, who was already doing a brisk business with Kroeger’s, refused to sell to her, she says. Shear found another distributor in Atlanta and began selling meat processed by two of Rubashkin’s competitors, Empire Kosher and Alle Processing, and chicken shipped from Canada. Shear says she was able to significantly bring down the price of perishable items—she sold cheese blocks for $16, and skinless, boneless chicken that went for $18 at Kroegers she sold for $8. Shear says that she quickly learned how easy it was to profit by creating competition in a niche industry in which prices were being kept artificially high. After the Memphis Jewish Journal featured her store in an article, she was so successful that customers began driving from as far as New Orleans to shop there. Soon, she began to receive calls from Jews in other parts of the South who wanted her to open additional stores. In Tampa, where the only kosher meat for sale came from Agriprocessors, grocers told her that shipments sometimes contained meat so discolored that it had to be thrown away. But if you complained to the Rubashkins, they told her, the orders would simply stop coming. Members of the Lubavitch sect told Shear something that has been corroborated by others: Their rabbis told them that they should only buy meat from Agriprocessors—nothing else was considered pure enough. In 2005, Shear met with the regional representative for her Atlanta distributor, Hudie Lipszyc. She says Lipszyc had driven six hours from Atlanta because he needed to tell her something. The distributor warned her to get out of the kosher-food business, telling her, she says, that if she didn’t, the Rubashkins would retaliate. She says he actually used the words, “They are going to squash you,” which turned out to be the same phrase two other people later used to describe the Rubashkins. And when she told Lipszyc she had no plans to close her store, he told her that she was actually in danger. Incensed, Shear told Lipszyc that not only was she going to ignore his advice, but she planned to open another store in Detroit. Before she moved to Detroit, however, she consulted with the vaad, the local rabbinical council there. Detroit had only one kosher grocery store, One Stop Kosher, and the meat counter in the back was run by Shlomo Luss, a Rubashkin distributor, who serviced the entire region. In Detroit, Agriprocessors meat was also the main source in town. Shear wanted to obtain permission from the rabbis before opening up shop. As she was driving back to Memphis, she received a phone call from the vaad: They gave her the go-ahead and assured her that she wouldn’t be treading on anybody’s territory. The Shears immediately turned the car around and drove back to Michigan. They purchased a home, renovated a warehouse, and bought thousands of dollars’ worth of cash registers, freezers, and other equipment necessary to run a store. In September 2005, a few weeks before they were going to open the branch, Shear got another call from the vaad: The distributor was taking her to a rabbinical court. Shear called the distributor. Shear says Luss threatened to spread a rumor that the Canadian chicken looked so clean because it was bleached, and that the meat she was going to sell didn’t hold up to kosher standards. Once again, she says, she was told that the Rubashkins would “squash” her. Luss couldn’t be reached for comment. Soon, Shear’s friends began to tell her about rumors spreading in the community: that her meat lacked kosher certification. Shear scrambled to get a certification letter from the Orthodox Union. She tacked the letter up in her store. But the rabbinical court made things difficult, issuing the decision that she could sell meat only by the caseload, which she says made it almost impossible to do business. (The vaad disputed this at the time.) She ignored the decision and went ahead. But a month after opening, some distributors that she had lined up to stock the store with products suddenly stopped selling to her. Shear says they didn’t return her calls. The Shears’ ordeal was well known in Detroit’s Jewish community and sparked an internal battle within the vaad itself. In September 2006, the Shears received a settlement of $160,000 from the distributor and the vaad. The settlement was just enough, she says, to make up for the salary she had lost during the year. In 2006, the Justice Department began an antitrust investigation into the entire kosher-meat industry. Shear isn’t the only person who says the Rubashkins don’t always play fair. Simon Fields owns a kosher supermarket in South Florida. He says that when he stopped selling Rubashkin products five years ago, the local Lubavitch rabbi told his congregants to stop buying meat from his store because it was no longer kosher, even though he had a valid Orthodox Union certification. “They left themselves exposed by their utter refusal to play by the rules,” said Mark Grey, a sociology professor at the University of Northern Iowa who studies recent immigration to Iowa. “If there was a hall of shame for employers in this industry, Agriprocessors would have its own wing,” said Mark Lauritsen, international vice president of the United Food and Commercial Workers, a union that has long tried to gain a foothold at the plant. a 30-degree day in Anchorage, referencing a nickname that the state’s Jews often use for themselves. Polls show Berkowitz, a former state legislator, is leading 17-term Republican incumbent Rep. Don Young, who has been engulfed by ethics questions over whether he earmarked federal money to projects that benefited campaign contributors. The state’s oil-for-gifts scandal involving the oil industry and several top Alaskan leaders, including U.S. Sen. Ted Stevens, who is on trial in Washingotn, also has benefited Berkowitz. Young, whose closest race in the last six years was a 17-point blowout, has become one of national Democrats? top targets this election cycle. The Democratic Congressional Campaign Committee is advertising in Alaska for the first time that anybody can recall. And Berkowitz has gone head-to-head raising money with Young, the powerful former House appropriations chairman who has steered millions of federal dollars to home state projects. Despite their small numbers, Jews were often central players in Alaskan history before the territory became a state in 1959. Jewish fur merchants were influential in opening up commerce and helped persuade the American government to purchase the 586,000-square-mile area from Russia for $7.2 million in 1867. Jews were also involved in founding major institutions, such as the University of Alaska, according to the Alaska Jewish Historical Museum. Although it’s been a while since a Jewish Alaskan has held a statewide position, several Jews have occupied significant public offices. Among them were Leopold David, Anchorage?s first mayor; Jay Rabonovitz, a former chief justice of the Alaskan State Supreme Court; and Ernest Gruening, a New York Jew who was appointed the first governor of Alaska when it was a territory and later was elected as one of the newly admitted state’s first two senators. The Harvard University graduate who earned a master?s degree at Cambridge University and a law degree from Hastings College, first arrived in Alaska to clerk for a judge in 1990. He now has several businesses, including a renewable energy start-up. He served 10 years in the state legislature, including eight as state House minority leader, where he proposed some of the earliest measures to invest in renewable and alternative energy. When first elected, he was the lone Jewish legislator. Later, when Jewish membership peaked at around six members, they formed what they jokingly referred to as the “yamulcaucus.” But besides joking about their common heritage, the Jewish lawmakers never found enough reason to meet formally. Berkowitz is not affiliated with any of the state’s handful of synagogues and doesn’t consider himself very religious. Yet he’s close with Rabbi Yossi Greenberg of the Lubavitch Jewish Center in Anchorage and has clearly been influenced by Jewish traditions: he had a bar mitzvah, was married under a chuppah, and held a brit milah for his son, Noah. (He also has a daughter named Hannah.) “By heritage, it’s very much who I am,” he said. He met his wife, Mara Kimmel, who is Jewish, in Alaska. “Everybody was always trying to set me up,” he said, noting that he and his wife actually met on their own. The comparison to Palin, who has enjoyed good relations with the state’s Jewish community, including Berkowitz, is perhaps ironic. If the ethics cloud over Young, Stevens and the state’s political establishment created the opportunity for Berkowitz to be competitive in the election, it was Republican presidential candidate John McCain’s selection of Palin that may threaten Berkowitz’s chances the most. She has helped fire up a Republican base demoralized by the scandals and a large Election Day turnout is expected to benefit Young. Berkowitz and other Democrats insist the state is becoming ?purple,? but statistics show that the 75,000 registered Democrats remain a minority among the 490,000 registered voters. There are more than 125,000 registered Republicans, and many of the remaining voters lean Republican. Berkowitz’s faith has not been an issue in a campaign dominated by ethics, energy, health care, crime and Young’s demeanor, but some attacks have been interpreted as thinly veiled bigotry – including allegations that he was a rich Jew from California. Berkowitz says his religion may be an issue for some voters, but he’s got bigger problems. “I suspect that the people who don’t like me because I’m Jewish don’t like me more because I?m a Democrat,” he said.